Whilimine Victora was manufactured in 1927 in Ruhr Valley in Germany. It worked in an industrial yard during World War II and did receive damage at that time. 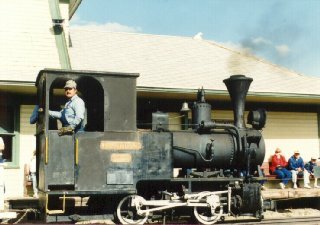 Prairie Village does have the original maintenance records of this engine. It uses a 24 inch (60cm) track and came to Prairie Village from Mankato, MN in 1969. This engine weights 8 tons and “one scoop of coal” will take it around the track if the fireman tries really hard. 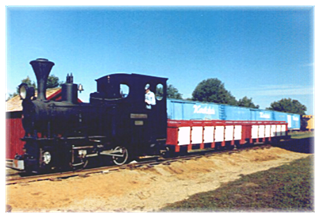 The #7 Whilimine locomotive is currently kept in the Prairie Village Roundhouse and is on static display pending repairs and restoration work.